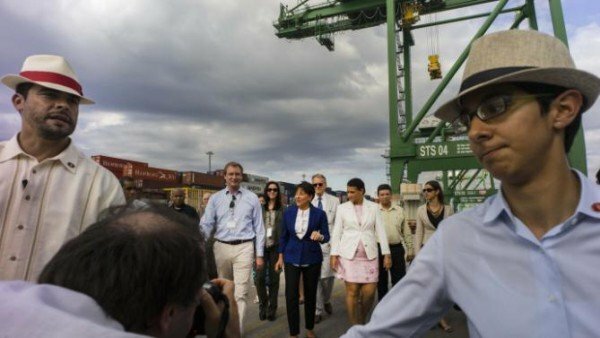 Home Tags Posts tagged with "secretary of commerce"
US Commerce Secretary Penny Pritzker has arrived in Cuba for two days of talks focusing on the trade embargo. Penny Pritzker will discuss recent measures approved by the US to mitigate the impact of the embargo. Since the US and Cuba announced last year they were restoring relations, President Barack Obama has pushed for the restrictions to be scrapped. However, Barack Obama faces opposition from the Republican majority in the Congress. Penny Pritzker is the most senior American official to visit Cuba since Secretary of State John Kerry reopened the embassy in Havana in July. Shortly after landing in Havana, Penny Pritzker visited the Special Enterprise Zone, an area developed near the Mariel port to encourage foreign investment. On October 7, the secretary of commerce is due to meet the Cuban trade and foreign ministers for discussions on the embargo. The US announced in recent weeks a number of measures to encourage trade even with the embargo still in place. American companies will no longer be breaking US law for setting up premises in Cuba, the US authorities announced. The Cuban government needs to lift some of its own bureaucratic and legal obstacles for the measures to work. There may be some reluctance from the Cuban authorities to allow a faster pace of change while there are other issues pending, such as new civil aviation rules, ferry services between Florida and Cuba and greater internet access. The first American economic sanctions against Cuba were imposed in 1960.